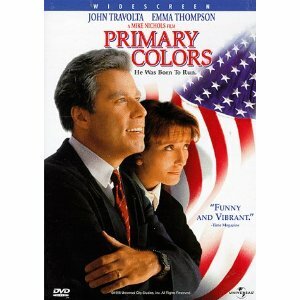 by GARY YAMASAKI Primary Colors (1998) presents a story set in 1992 of Jack Stanton, a philandering southern governor, vying for the presidency. Sound familiar? John Travolta, who plays the governor, even sports a Clintonesque accent. Not surprisingly, all the action of the movie swirls around Jack and his wife Susan–the Hillary character. But which of the two is the point-of-view character? In other words, is it through Jack’s point of view or Susan’s point of view that the viewers are led to experience the campaign? One storytelling device used extensively in the establishing of point-of-view characters is having the audience “follow” a particular character for a significant stretch of a narrative. This being the case, simply observing which of the two the camera follows should help us in determining who is the point-of-view character of the film. The movie begins with a couple of scenes of Jack campaigning at a school, Susan not being present; with the camera following Jack like this, it would appear it is Jack, and not Susan, who is being established as the point-of-view character. However, in the scene following this sequence, Jack is nowhere to be found. And the fact that the camera stops following Jack at this point indicates he is not being established as the point-of-view character either. A look back over these early scenes reveals an interesting dynamic. One of the first characters introduced to the viewers is a young man named Henry Burton who is being recruited to join Jack’s team as a campaign co-ordinator. This being a low-profile position, he would not be expected to make any major contributions to the success of Jack’s campaign, and so, it is easy for the viewers to dismiss him as a mere bit player in the movie. Yet, as the storyline unfolds, there he is in scene after scene after scene, occasionally serving as the focus of attention, but more often being depicted simply as a part of a crowd watching the more major characters do their thing. However, as scene follows scene with the other characters coming and going, Henry always seems to be there. In fact, an audit of the whole film reveals he is present in every single scene. . .the ultimate in the execution of the “following” technique. So, in contrast to the Oct 4/12 post’s discussion of how being made to follow Jesus in the Gospel of Mark leads the readers to experience the events of the storyline through the point of view of the main character of the story, our current example of following Henry in Primary Colors demonstrates this technique is capable of having an audience experience a story through the point of view of even a minor character. And experiencing the story through Henry’s point of view means this movie is not about the Clinton-like main characters; rather, it is about Henry’s experience of the Clinton-like main characters.